Back in 1984, I bought Deep Six and his vehicle, the SHARC, because of both the Marvel comic and the figure’s action feature. The comic heavily featured Deep Six and his ride in an iconic issue that also fully debuted Zartan. How could I have resisted begging my parents to buy me every toy that showed up in that issue? As Kirk Bozigian has said, the Hasbro marketing crew back then truly was diabolical! Although the SHARC itself isn’t one of my favorite vehicles these days, I loved the thing when it was new. 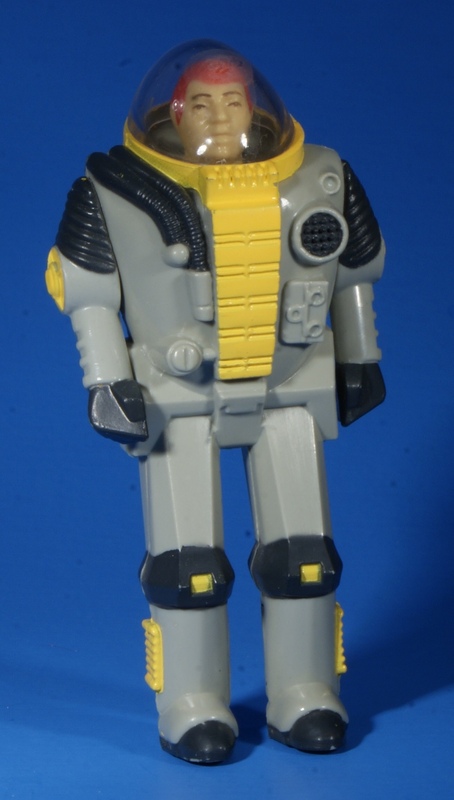 Looking back on the design of Deep Six and the SHARC, I can feel a sort of vibe back to the GI Joe sub of the 12 inch era.It’s not so much the look of the toys as the groove I get from their use. I don’t know if that was the intention of the designers, but for me it’s a neat little bridge between the eras. The actual figure had the coolest diving action feature that was perfect for use in a pool. 1984 was a banner year for Joe vehicles hanging out in our family pool. Unfortunately, I didn’t realize at the time the effects of chlorinated water on plastics. Subsequently, both my SHARC and Water Mocassin turned funky colors. Sure, Deep Six is one of the most limited figures of the time in terms of articulation, but it’s only a side effect of a pretty neat little feature. While a normally articulated figure dressed in his non-diving apparel would have been a nice addition (say for a 2000s era comic pack) the good old original Deep Six brick will always be a cool reminder of 80s summer fun with Joes at the pool. Never had him as a kid but I got him and the SHARC for my boys and he was a hit! I love the ME version the way they articulated the elbows and made the bubble removable. The legs could’ve used some articulation too, the technology and know-how was there. When i was a kid, i had a SHARC. Years later, i tried to find it on YOJOE but i was unable to. Turns out it was the sky patrol version and the paint had just fallen off. Oh and that detail on the underside. Its a 1/35th US halftrack door. The definitive version for me would be a figure of Deep Six in his regular clothes and cap as seen in issue #25 of the Marvel comic (easy DDP-era Shipwreck repaint with new head) along with an attachable diving suit with articulated arms, knees, and removable bubble helmet. Easy custom would be DG Shipwreck, the head from ME version, add RoC Pit Commando boonie hat. There’s an opportunity for some third party manufacturer to make a drop in seat that would fit in the Sharc’s cockpit so other figures could sit in it easier! Best non fully poseable G.I.JOE ever! As much as I dislike this figure, you’re dead-on about the diving action feature. Deep Six, the SHARC and the Water Moccasin were staples of pooltime play in the summer. I’d forgotten about that! When I got him as a kid from a garage sale, I was skeptical he was even a GI Joe figure. The filecard that came with the purchase convinced me, but I never knew why the figure was so outlandish til later on. He’s even stranger (greater deviation from the GI Joe articulation/figure mold standard) than even Golobulus (though in style, Golobulus is one of the most ‘out there’ figures). ‘Fish tank figurine’ 1989 Deep Six helped clarify what they were going for with this Deep Six. Deep Six had a pretty strange path if you think about it. 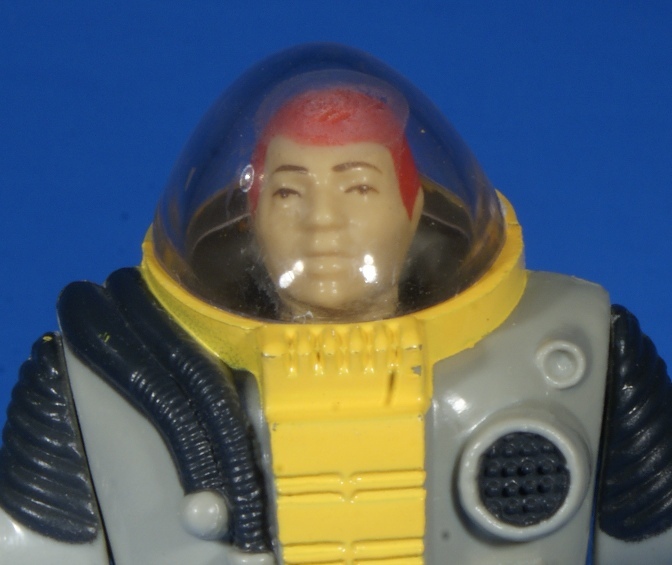 He starts off in this huge deep sea diving suit of armor to withstand the pressures (which should mean he can go where even Eels can’t), a terrain as out there as space is, then he gets a new mold in 1989 which looks like a really old school Diver Dan/hard hat diving suit (there were some Sea Hunt episodes showing how SCUBA gear could run circles around it) but colored like they were inspired by fish tank ornaments, then he ends up in a leaner diving suit fighting eco-crime & Cobra with Flipper. Never liked this figure for the lack of articulation. Playmobil did a similar item but you could remove the dive suit in two halves, that would have been good with this figure, or the 25th version. Perhaps they could have added a rubber rim around one half of the suit so once clicked shut it repels water thereby retaining the diving and surfacing feature of the original?